Roger and Patty, co-owners of Coffin, Coffin, and Blackman, are attorneys who specialize in Medicaid planning, before or after entering a nursing home. Primarily, they help seniors and disabled persons plan their care as they transition to a nursing home or extended hospital stay, and assist the client in protecting their assets during this time. Related services include wills, trusts, powers of attorney, deeds, and guardianship. Disability Attorney Lisa A. Blackman joined Roger and Patty in 2001. They employ four full-time office staff. In 2006 Roger and Patty partnered with two escrow professionals — mother and daughter team Shannon Wiggins and April Lamar — and started Action Title and Escrow. 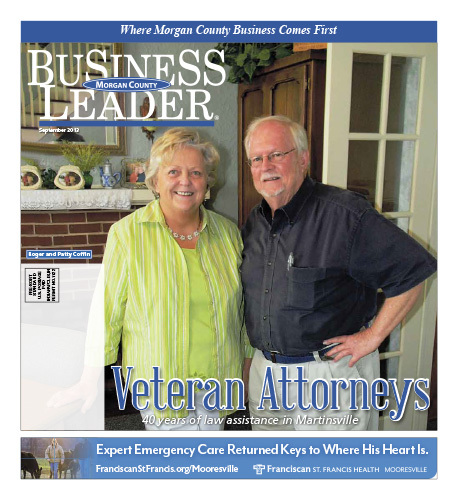 Roger remembers, “Their companys wanted to move them and they wanted to stay in Martinsville, so we offered to establish a title company to keep them here, and keep a valuable in Martinsville.” Action Title, under the management of Patty Coffin, has blossomed, with four full-time and three part-time employees. Patty says that internet technology has changed the face of the title business. “We can seek business anywhere across the state, use independent contractors, and close details remotely. It’s the future of the industry, and has evened the playing field, so a company like ours can thrive in Martinsville without having to relocate to Indianapolis. Download the full September 2013 Edition here.